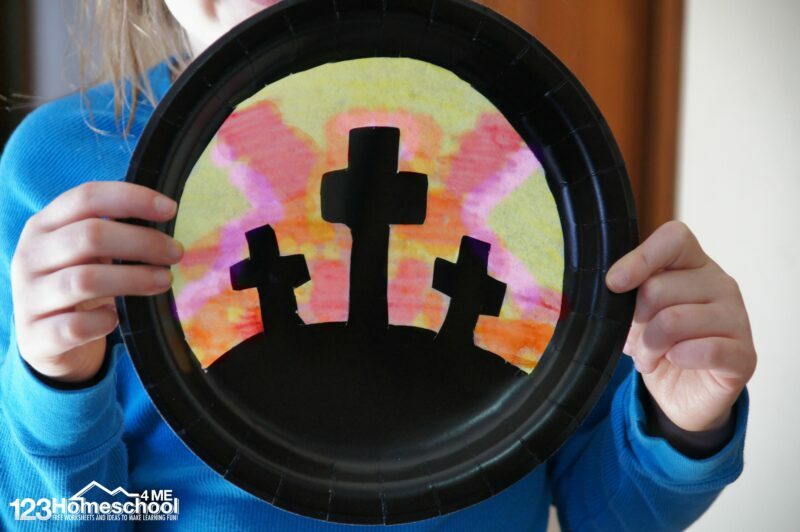 Whether you are looking for a fun Easter craft or ideas for an Easter Sunday School Lessons you are going to love this beautiful cross craft for kids. This craft is well suited for Preschool, Kindergarten, 1st grade, 2nd grade, 3rd grade, and 4th grade kids. This is such a fun, easy to make Easter craft for kids. 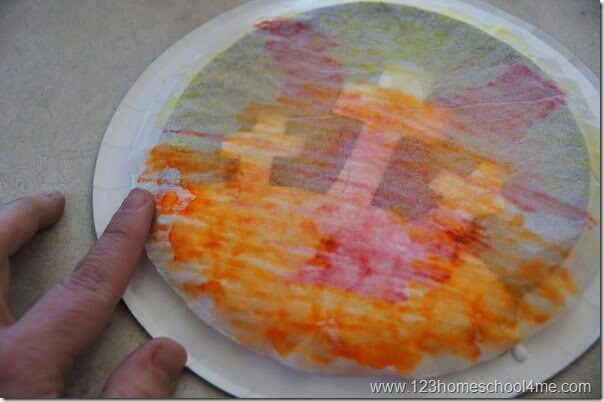 Kids from Preschool, Kindergarten, and 1st-5th grade will all enjoy making this craft. It is perfect for at home or as part of a Sunday school lesson. I love that kids unique style will make this beautiful Easter Cross Craft turn out differently every time! 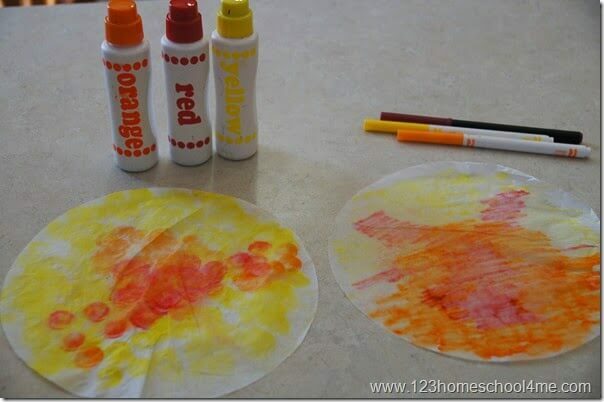 On a covered surface color a coffee filter with bingo markers or markers in shades of red, pink, orange, and yellow. Now use a spray bottle to lightly mist on the coffee filter which will smear the colors nicely. 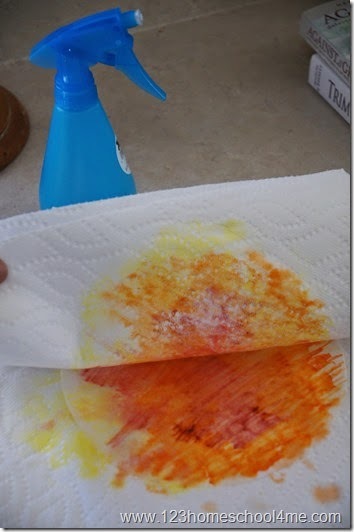 Blot with a paper towel on the top & bottom to get off the excess moisture. Note: Coffee filter will be dry and ready to use in 10-20 minutes. 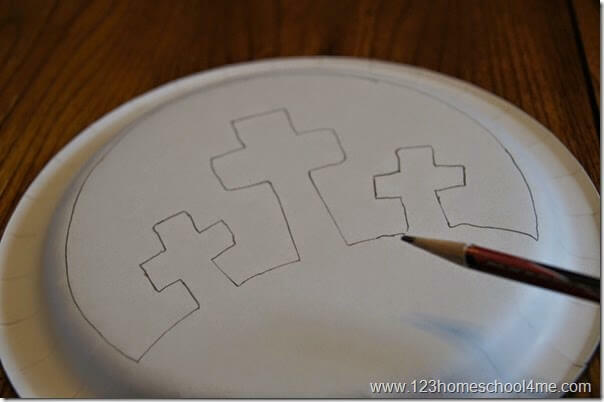 Using a pencil draw a scene of the crosses of Calvary on your plate like above. Using scissors punch through the plate on the line. Then cut out the scene you traced. Note: If you are using this for a Sunday School class, use this plate as a template to trace the other plates. I was able to cut to plates stacked up at a time. It took me about 90 minutes to get 60 crafts and an example ready. Now put glue on the back of the plate. Make sure to go all around the edges and up the cross and hill. If you use liquid glue just don’t use too much. Stick glue or tape also works really well. Now press your dry, colored coffee filter on the glue and press down the edges and center. Wipe away any extra glue. 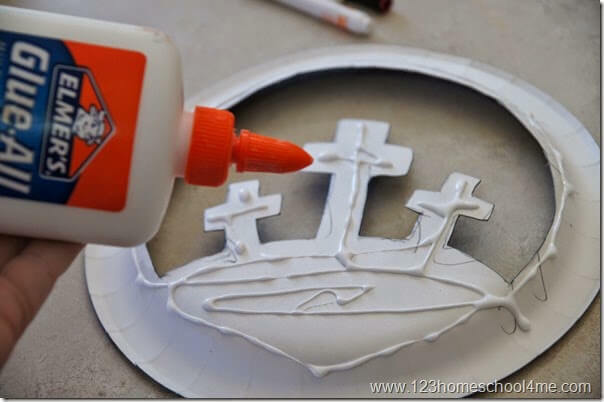 There is one of the possible looks for this Crosses on Calvary Easter Craft. I love that it is sturdy and durable – which is great for Sunday School kids to take home. Plus each kid did such a good job varying up the look and style of their coloring there were some truly beautiful stain glass window scenes. 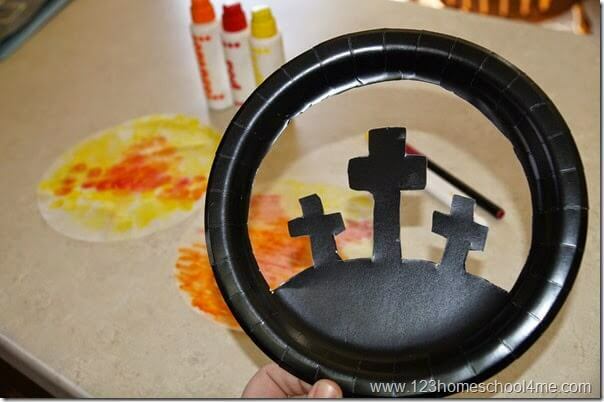 This craft was a huge hit for our Easter Sunday School Lesson!